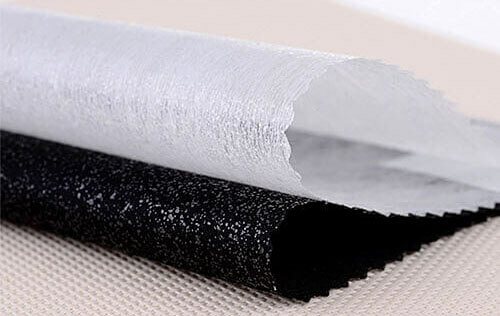 Quality and function of fusible interlining. 1. The hot melt glue coated evenly on lining cloth and has certain peel strength when adhesive to the fabric, not degumming within the operation time limit. 2. It can adhesive to the fabric at the right temperature and pressure. Meanwhite, not harmful to the cloth and hand feeling when iron on. 3. The hot compression ratio of fusible interfacing is consistent with the fabric, after ironing bonding, has good conformation. 4. Press and iron on the fabric, side of interfacing fabric and cloth can’t seep glue. 5. Shrinkage of the lining cloth is consistent with cloth, adhesion and compatibility of fabric is very well, keep the good appearance after washing, not wrinkle. 6. The durable adhesive glue is necessary to have excellent washing function, resistant to dry clean, not degumming and bubbles after washing. 7. Good follow-up and elasticity, appropriately hand feeling, suitable for each part of the dress, meet the different needs of soft, medium or hard feeling. 8. Has good air permeability, make sure to wear comfortable. 9. Has the anti-aging function, in its storage life and use period, bonding strength unchanged, without aging yellow appearance. 10. Have excellent sewing function, slide on the sewing machine freely, not make the needle dirty. The lining cloth does not need to have all the above functions, you can choose interlining according to main purpose.